(CNN) - Mitt Romney is back on the campaign trail, this time in Virginia. The former Massachusetts governor and 2012 Republican presidential nominee will headline a fundraiser Tuesday evening in the Richmond area for GOP Senate nominee Ed Gillespie. Gillespie, a former Republican National Committee chairman and senior aide to President George W. Bush, was also a top adviser to Romney during the 2012 general election campaign. This is the second time this year Romney's served as the main attraction at a Gillespie fundraiser. He headlined an event for Gillesipie in New York City in March. Gillespie faces an uphill climb in the general election against Democratic Sen. Mark Warner. After the fundraiser, Romney and Gillespie will join Bill Bolling at the former lieutenant governor's annual "Burgers will Bill" event. This is will be Romney's second appearance at the gathering, which Bolling has been holding for some 20 years. Bolling was campaign chairman in Virginia for Romney in both his 2008 and 2012 White House bids. Bolling says Romney can help bring Republicans in the state together. "Someone like Gov. Romney is well known and well respected and he can be like a voice saying to the tea party groups, to the more libertarian Republican groups, to the more traditional Republican groups, that we all need to come together to help support Ed Gillespie in his Senate race. So I think he can be a unifying voice within the party," Bolling told CNN. The events are being held in Glen Allen, Virginia, just outside of Richmond. The area's part of the state's 7th Congressional District, which last week witnessed a shocking upset in the GOP primary. House Majority Leader Eric Cantor was defeated by a little-known and underfunded economics professor who enjoyed some support from local tea party activists and other grassroots activists. Bolling says he invited the candidate, Dave Brat, to his "Burgers with Bill" event, but said Brat was unable to attend. Bolling, a longtime Cantor supporter, said he reached out to Brat after his upset victory last Tuesday. "We want to make sure we hold that seat with a Republican congressman so I reached out to Dave and told him that I'd do anything I can do to support his candidacy," Bolling said. Romney's appearance in Virginia comes just a couple of days after he hosted a major ideas summit at a resort in Park City, Utah, that attracted top leaders from the political and business worlds. The event also included a bunch of potential 2016 GOP White House hopefuls. 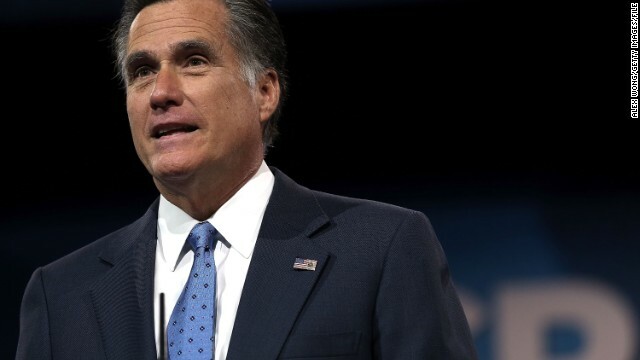 Since his defeat in the 2012 presidential election, Romney has taken on the role of Republican Party elder statesman, in hopes of helping shape the future of the party. And he has made endorsements in a number of GOP primary battles, often backing more moderate candidates, many of whom were Romney supporters during the past two presidential elections. The more he's seen, the less likely republicans are to be elected. Personally he makes me sick. A real class act that should be in the White House. Learn your lesson America. Don't believe Obama, Liar of the Year and his army of mindless droids. "Since his defeat in the 2012 presidential election, Romney has taken on the role of Republican party elder statesman"
Yeah. Whatever gets him to sleep at night. America dodged a big one by not voting this delusional man as President of the United States. That he seems to think otherwise is his problem to deal with, not mine. I'm chalking it up to another sour grapes tin-foil hat loser unable to accept reality. GOPerville's cup runneth over, no doubt about it. There goes Mr. 47% again!! A real class act that should be in the White House. If he were REALLY a class act, he would keep his mouth shut so all those sour grapes wouldn't fall out! I don't recall ANY dem candidate EVER behaving the way the 2008 & 2012 also-rans behave. Sore loserdom at its finest! Can you say, "I'm not concerned about 47% of Americans....."? America decided that he had less class than Obama. If there was an election today with Obama and Romney, Romney would win in a landslide. The Liar of the Year pulled one over on the country in 2012 but it wouldn't happen again. If there was an election today with Hillary and Romney, Hillary would win in a landslide. Mr. 47% attempted to pull one over on the country in 2012 but it wouldn't happen again. Since the presidency is limited to two terms, Obama will not be running again. I suspect Romney won’t be either. Obama will probably take some time, make some speeches, do generally the same stuff that other former presidents do. That is, until Hillary nominates him for the Supreme Court. I don't think so. The fools that are buying all the conspiracy theories voted against Obama originally. Hmmmm. What was that Mr. Romney claimed... that the U.S. was selling Jeep to China. Yeah, that was it. He kept it up even after the chairman of Fiat told him he was wrong. No, not lyin' Romney. Just the facts....., yeah right. Money brags couldn't get elected dog-catcher. Dream on.... in your little lala land of no taxes where everyone has six figure jobs and cayman island bank accounts. Maybe you can go to tier three heaven in your magic underwear with him, but slick mitt will never be President of this country. No one who refuses to show the people that he did not pay any taxes on his millions and millions (he 'earned' from laying off hard working middle class folks) for years and years will ever be elected by the People. HEY, he did pretty good in the GOVENORS race, FOR THE DEMOCRATS, thanks mitt, once a FIVE TME LOSER always a LOSER!!!!! We need a mormon leader to save us from the wrath ! A loser as an advisor ..............Well, good luck with that.